The american Smithonian Institute now offers 3D scans of museum specimens in a form of an interactive software application X 3D developed by Autodesk. Precious artifacts are no longer separated from visitors and researches with security glass - on the contrary - visitors are encouraged to "touch" and explore the specimens in detail. Less than 1% of the Smithsonian’s collection is on display at any time, and some objects in their collection will never be on display. So virtual presentation of detailed 3D models allows to explore full scale of artifacts and treasures from the museum collections not only for today's visitors but also for future generations. 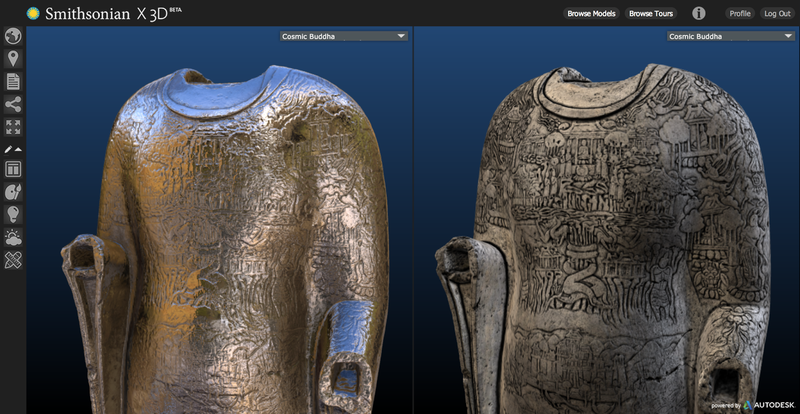 The scanning and 3D modelling process relied on Autodesk ReCap and Autodesk Maya software to easily and quickly capture artifacts with photos and turn them into detailed 3D models that can be viewed in “Hollywood style” quality with the x3D Explorer. The first 21 representative objects from the museum collection were 3D-scanned so far. These artifacts are now available for public viewing, including interactive notes in the "Smithonian x3D Explorer" viewer. Some of the models can be also downloaded and used e.g. for 3D printing. 3D technology is revolutionizing museums in the same way it has revolutionized entertainment, manufacturing, and architecture.